We'll be adding workshops as the year progresses, so check back to see what's new! Workshops at Land's Sake are an excellent way to connect to the community around you, meet people who share similar interests, learn practical farm and outdoor skills, spend time in nature, express creativity, and have fun! Advance registration is required for Adult and Family workshops. Family workshops offer activities accessible to all ages and designed to engage adults and children together in projects that encourage teamwork, skill building, and hands-on fun. Make family memories as you create crafts, make food, get moving, and more! All children must be accompanied by an adult. Adult workshops welcome local experts on a range of topics to share their skills and expertise with the Land's Sake community. Learn cooking, history, flower arranging, and more through our year of workshop offerings. Register now for Paint Outdoors on the Farm! See the beauty of the farm through an artist’s eyes, sample the world of outdoor painting, learn how to paint with pastels, and create your own artwork! The art of painting outside—‘chasing the light’ as some call it—goes back centuries and owes its popularity to the French impressionists. Experience its joys (and challenges) for yourself with local landscape artist, Larry Grob. Larry works with pastels, an ideal medium for working with outdoors. Both single or multiple sessions are available…and are designed to fit your schedule. The workshop includes an artist demo, personal coaching, overview of pastel materials and plein air basics—from composition to color, and supplies & equipment. Starter supplies are provided. If you have your own pastels and field easel, do bring them, but it’s not required. Beginners are welcome, as are seasoned artists. Great for all ages -- young or old, come find your inner artist with pastels. Bring your friends and enjoy the nature around us as it evolves with the farm season! 10% off if you schedule 3 or more private or group sessions. This event is outdoors, so please dress accordingly. We will ‘wander’ the farm, so dress for and guard against poison ivy and bugs. Register now for a Flower Workshop! Land’s Sake has taken pride in growing a diverse and abundant Pick Your Own Flower Garden for decades. Join our in-house florist to learn about different flower varieties and how to arrange & care for your bouquets. 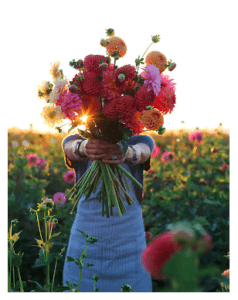 Get Creative while picking your own in season fresh farm flowers to arrange and take home. All cutting supplies, a mason jar & 25 stems are included in class price, (additional stems are available for purchase.) You may bring a favorite vase from home to practice with & get some tips on how to create & care for your arrangement! Great for all Ages & Experience! Whether it’s your first time or you’re a seasoned pro, this workshop is fun for everyone. Each class evolves with the seasons and we ALL learn something new with the inevitable surprises in nature. So bring your friends, or make some new ones while enjoying the beauty of farm flowers. This event is outdoors and will take place Rain or Shine so please dress accordingly. 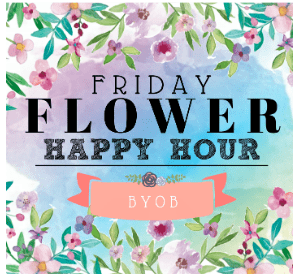 Register now for Flower Happy Hour! A wonderful way to de-stress after a long week while being creative! Bring your friends or make some new ones with a new twist on Happy Hour. Enjoy an evening on the farm in our Pick-Your-Own flower garden cutting and arranging your own bouquet. Our In-Farm Florist will be there to assist with creations and delve out tricks of the trade. Class includes approx. 25 stems, all cutting supplies & a mason jar, or bring your favorite vase from home. For special occasions or groups of more than five people, please Contact Heather. Bouquets & Bubbly… Enjoy some adult refreshment on the farm while you create! You may bring drinks of your choice, we do ask that you bring your own supplies, cups, cooler, ice etc... and take your trash with you please! Land’s Sake Farm only condones responsible drinking. Join us for this fun, educational annual event for all ages! Tu B’shvat is traditionally a time to assess our field and fruit trees. 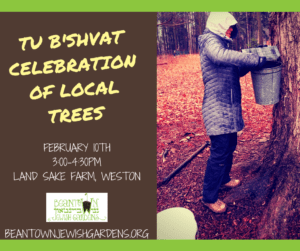 Led by the Land’s Sake and Beantown Jewish Gardens educators, we’ll explore the sugaring process, from tree-tapping and wood splitting to boiling and bottling.Making local maple syrup is highly weather dependent, so our exact activities will be determined closer to the program date. Be prepared to be outside. Cost: $10/person (non-member) / FREE for 2019 Land's Sake Members. Professional florists Trish Scozzafava and Jessica Pohl from A Natural Arrangement invite you to join them to learn how to make gorgeous seasonal wreaths! Bring your friends and create, chat and nibble the day away. Attendees will create and take home a holiday wreath. Learn to make a fresh, long lasting wreath from local Land's Sake greens! Materials and decorations provided. Foliage will be provided by Land's Sake. $40 per person; please sign up here. Location: The Melone House/Land's Sake Office at 27 Crescent Street in Weston, MA 02493. Please note: The "27 Crescent St" address confuses some GPS apps, so enter "25 Crescent St" instead. Then, when you are on Crescent St, look for Land's Sake's sign on the mailbox for 27 Crescent St. Follow a long driveway through the woods to a parking lot, and we will be located in the farmhouse. If you are navigating the old-fashioned way, please know that Crescent St is off of Rt. 20/Boston Post Road, on the east side of Weston. Please drive slowly down our driveway, as this is a single-lane driveway with lots of neighbors. Ayurveda, an ancient healing system is based on deep understanding of eternal truths about human body, mind and spirit. We are born with our own particular balance of five elements, which creates our body constitution. We maintain our health and wellbeing when these five elements remain in balance. Ayurvedic seasonal routines and dietary guidelines play an important role in preventative health. By following simple guidelines, you can help mitigate the toxins that accumulate due to seasonal changes. Come and learn how you can detox your system with simple daily routine. Take home some healthy recipes. Taught by Weston resident Anjana Bhargava, an Ayurvedic Wellness Counselor. Location: Land's Sake's OFFICE location, 27 Crescent St. in Weston, MA. To find the office, enter "25 Crescent St" into your GPS, then look for Land's Sake's sign on the mailbox for 27 Crescent St. Follow a long driveway through the woods to a parking lot, and we will be located in the farmhouse. If you are navigating the old-fashioned way, please know that Crescent St is off of Rt. 20/Boston Post Road, on the east side of Weston. Free, drop-in Volunteer Days at Land's Sake Farm! Come spend time outdoors, practice farming and land management skills, give back to the community, and make connections with like-minded people. Open to all ages, youth under age 14 must be accompanied by an adult. Agni is a vedic term meaning burning, transforming or perceiving. Our health largely depends on how well we are able to digest, absorb and assimilate nutrients from our food. Agni (digestive enzymes) is the internal digestive fire that transforms all food as well as sensations coming into the body. Food conversion to energy requires an essential biochemical reaction. We can suffer from several health issues like stomachache, diarrhea, or constipation etc. if our digestive fire is not working right. Join this class to learn about your digestive fire- what can you do to enhance it to live a healthy lifestyle. Take home some spices. To all Land's Sake Flower Lovers! Come join us on the farm for a workshop on what to do with all the wonderful flowers you can pick here at Land's Sake! Our Farmstand manager Heather enjoys making floral arrangements for our dinner parties and wants to pass on her tips to you! In this workshop, you can learn great ways to cut & assemble these gorgeous flowers, and how to keep them lasting as long as possible! Attendees will be able to cut a 25 stem bouquet & receive a complimentary mason jar, or you can bring a favorite vase from home! And if you want to get carried away with creativity, additional flowers can be purchased for larger floral arrangements. So bring a friend, or make some new ones, and enjoy a relaxing evening of wild flowers on the farm! Spend an evening—that very special, dramatic time of day—seeing the Farm through an artist’s eyes. Drop in for a demo, some coaching, and a chance to find your ‘subject’, from long views to closeups. 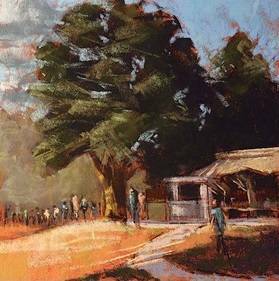 Weston landscape artist Larry Grob will introduce you to plein air and then circulate, providing individual coaching and critique. No prior experience is necessary, but seasoned artists are welcomed as well. Bring you own materials and supplies…from pencils to oils. Larry will supply you with a handy ‘composition’ guide. No advance registration or payment is required…just drop in (though you may pre-register if you choose.) Please, however, check the Land's Sake website (here) for weather related cancellations. Soak in the summer sun with yoga on the farm! Certified Kripalu yoga teacher, Jaime Silverstein, will lead a vinyasa inspired yoga class open to all levels. Nourish your connection with mind, body, soul, and earth in a grounding and flowing practice amongst the beauty of the plants and animals on the farm. Please bring your own mat or blanket and water. Jaime Silverstein is a yogi, herbalist, gardener, and environmentalist. Jaime's teaching weaves the mindfulness and self-study of Kripalu Yoga, the fluidity of vinyasa flow, and the deep reconnection to nature that Metta Earth Yoga teaches. She believes that the lessons we learn on the mat can be taken off the mat, cultivating more balance and compassion in our interactions with others and with the environment. Learn how to capture the farm’s beauty with pastels. All are welcome as local landscape artist Larry Grob helps you explore the potential of this wonderful medium, working on various scenes around Land’s Sake. Larry will demo, share tips on subject selection, composition, and technique…and provide coaching as you work on your own painting. You don’t have to be an experienced pastelist…come find your inner artist! Sanded paper pastel boards and foam core sleeves for transporting your work will be provided. Do bring pastels and a field easel if you have one. Larry will have a starter selection available to share if you don’t have your own. Morning coffee and snacks will also be provided. Advance registration is required. Join Land's Sake Education Manager and Herbalist Anna Booth Cohen for a walk of the local and cultivated medicinal plants at Land's Sake! There is an amazing variety of natural medicine growing all around us. This plant walk will feature a variety of medicinal plants in season, both cultivated and wild. Expect to meet different plants each season. This is a great opportunity to connect to our ecosystem in an inspiring, empowering way! Anna will discuss plant ID, common growing conditions, and the traditional medicinal use of each plant. Everyone from new beginners to seasoned herbalists are welcome. Open to all ages, youth under age 14 must be accompanied by an adult. For most people today’s life is busy, fast, challenging and thus not without stress and fatigue. By understanding the fundamentals of Ayurveda and adopting the simple tips in our life; can be very helpful in coping up with the fast paced life and taking care of the toll it takes on our physiologies. Weston resident Anjana Bhargava, an Ayurvedic Wellness Counselor will lead a discussion where you will learn about the body types, food combination, herbs/spices and how you can incorporate it in your life to live a healthy life. You can take home some sample spices/herbs and recipes home and try some healthy herbal teas etc. Reduce stress and connect to nature through gentle guided and silent meditation in a quiet corner of the farm. Sip herbal tea, listen to the beat of the drum and the sounds of the meadow, and let the stress of your week slip away. Each gathering will begin with a check in then move into a guided meditation with herbal tea. Participants will be invited to reflect after the first meditation before opening the space to quiet mindfulness, guided by a drum beat. The gathering will end with a reflection and check out. Open to all ages, youth under age 14 must be accompanied by an adult. Find yourself on the Farm. Bring your mat and connect with nature as we move through an invigorating one hour yoga class on the farm. Yoga Teacher Steffany Doolittle, will guide you through a unique variation of vinyasa flow yoga, linking breath and movement, leaving you feeling energized and peaceful. Classes are different each week and variations for many postures are given to tailor each individual. All levels welcome! Ready to learn how to shoot a traditional bow? On the Mark Archery is excited to partner with Land’s Sake Farm to offer a special night of shooting that will teach you the fundamentals of traditional recurve archery while enjoying the outdoors. Enthusiastic and passionate coaches provide all equipment and motivation needed to focus the mind and hit the target with consistency throughout the session. Relax, have fun and come join us to explore one of the world’s oldest games! Celebrate the magic of summer at Land's Sake's Fairies, Gnomes, and Elves Festival! We will have stations set up around the farm that offer fun, creative activities for children to enjoy. Build fairy houses and gnome homes, make your own magic wand and fairy/elf crown, drink fairy tea, and visit with our resident chickens and rabbits. Enjoy stories, games, and more! Free parking available onsite. Backpack babies are welcome free of charge. Activities will be geared toward ages 3-8, but all ages are welcome! Join Lorraine Fitzmaurice for a song and dance hour for families with young children. Come sing (and dance to!) songs about seeds, plants, farms, and animals. Some you may already know, some will be brand new! Take what you learn home with you in a little booklet and start growing your own family singing tradition. Join Lorraine Fitzmaurice to explore the folk traditions of the British Isles and Appalachia in a pastoral setting! Many songs were created to be sung while working on the farm, or feature herbs, animals (especially birds), and the turning of the seasons as themes. We'll sing ballads, dance tunes, and work songs and each participant will receive a booklet of what you've learned to practice at home. You do not need to read music for this course. Ages: Adults and teens. Anyone under 14 must be accompanied. Join Land's Sake Education Manager and Herbalist Anna Booth Cohen to learn about our local, wild "superfoods!" Participants will learn about the nutritious and medicinal wild plants that grow abundantly in spring. This experiential, hands-on program will include information and practice in harvesting and plant ID, traditional medicinal use, and preparation for several local medicinal plants. Everyone from new beginners to seasoned herbalists are welcome. Open to all ages, youth under age 14 must be accompanied by an adult. Interested in Sharing Your Expertise? We are looking for partners who have skills to share to build our 2017 workshop series. If you are interested in leading a workshop at Land's Sake, email education@landssake.org or call 781-893-1162.